Howard Alper, is a Distinguished University Professor at the University of Ottawa. 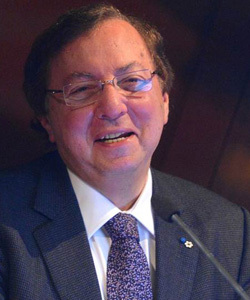 He has previously served as Chair of the Board of Governors of the Council of Canadian Academies, Canada’s Science, Technology and Innovation Council, the Canadian Research Knowledge Network and the IAP-Global Network of Science Academies, and is a former president of the Royal Society of Canada. Dr. Alper is a member of the Advisory Committee for the US National Science Foundation, and the Science Advisory Committee of the World Economic Forum. He is currently a member of board of African Institute for Mathematical Sciences (AIMS). Dr. Alper has a PhD from McGill University, 1967.